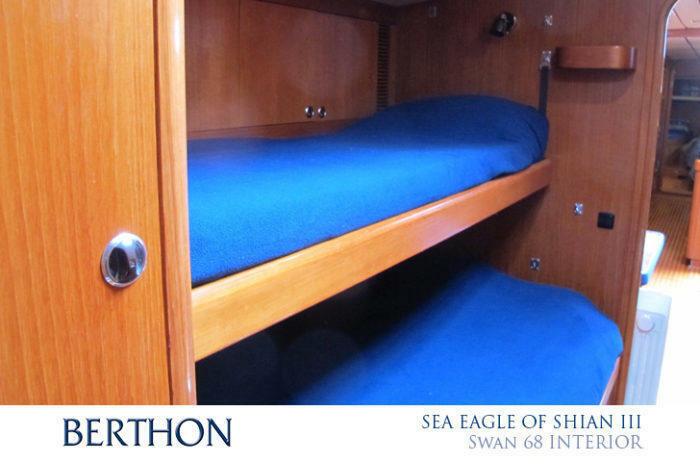 Swan 68 SEA EAGLE OF SHIAN III is now available for sale with Berthon and is currently stored ashore, under cover in Scotland where she awaits a new owner to awake her from her slumbers. 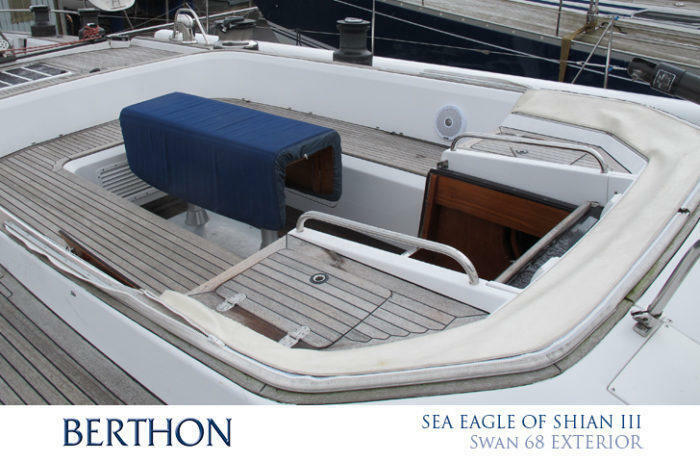 Her owners’ change of plans means that their programme for the yacht is now complete. 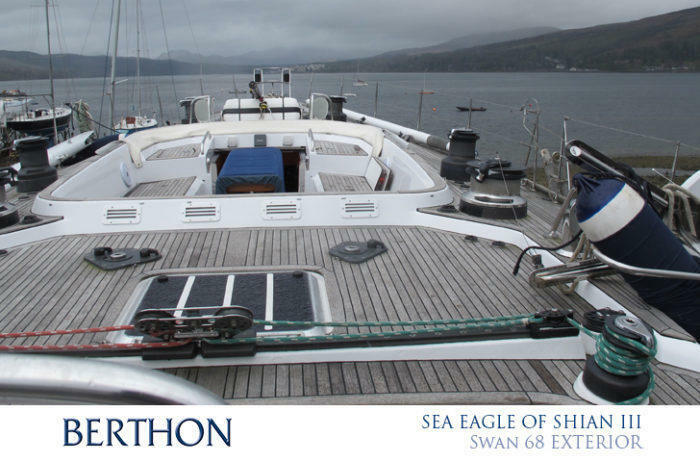 SEA EAGLE OF SHIAN III has been MCA coded and could be re-coded by a new owner if this was interesting. 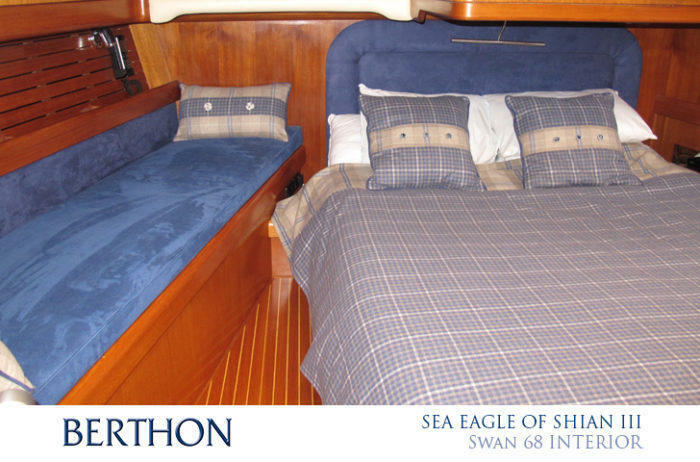 • Sailor Fleet BB250 with additional handset in owner’s cabin. • Icom M505 VHF and Command Mic at helm. • Icom M801 E SSB. • TH Bury cell phone cradle with external antennae. • Furuno SC50 satellite compass. • Furuno GP 32 GPS with data distribution through isolated buffers. • Raymarine ST60 speed depth and wind systems. • Additional St60 wind and graphic displays. 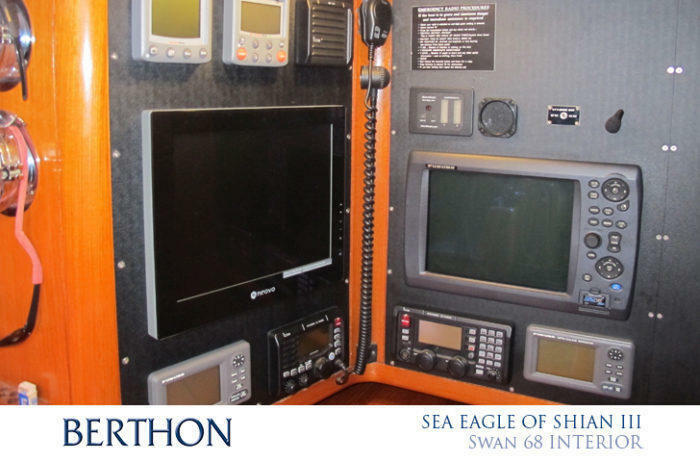 • Raymarine SPX30 and 2 off ST6002 control Autopilot system (hydraulic pump also replaced). • Ruggedized shuttle style comms pc with 17’’ glass fronted monitor. • BEP 2 zone Gas alarm system. 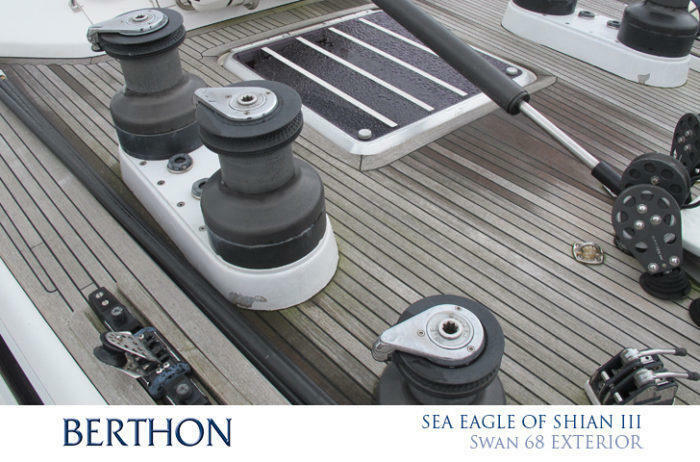 • All navigation light fittings replaced (Aqua signal series 55). • 2 off Furuno Navnet 3D MFD 12 displays. • Maxsea time zero explorer software loaded onto comms pc and interfaced to Furuno system. • Furuno DRS4D digital radar scanner. • Furuno FA50 AIS transceiver. • Mood lighting in saloon. • Entertainment system consisting of BOSE lifestyle 235 system in saloon, Blu-ray player, exterior BOSE 135 speakers in both cockpits. • New 12mm teak deck laid in 2008. • New Awlgrip Aristo painted topsides in 2008. • Full anti-osmosis treatment including nine coats of Epoxy in 2008. • Full Engine revision including new turbo charger in 2008. • New Navtec rod rigging in 2015. • Mast removed and serviced in 2007; mast and boom painted 2015. 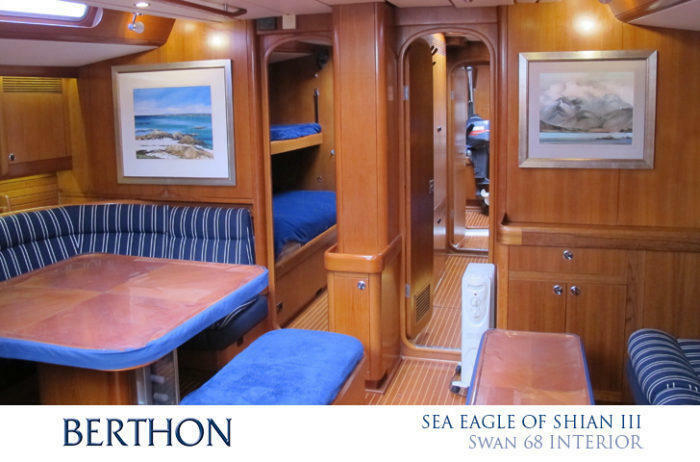 SEA EAGLE OF SHIAN III has been priced to sell and offers are invited. 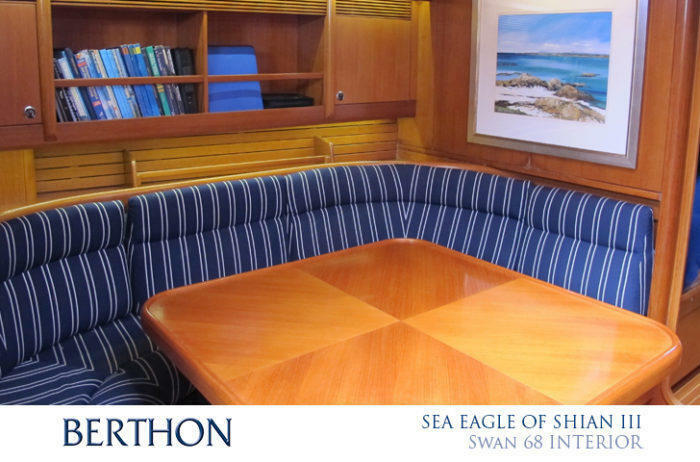 A superb, fast cruiser racer as only Nautor Swan really can, she is perfectly set up for ocean mile munching and comfortable, lazy cruising. 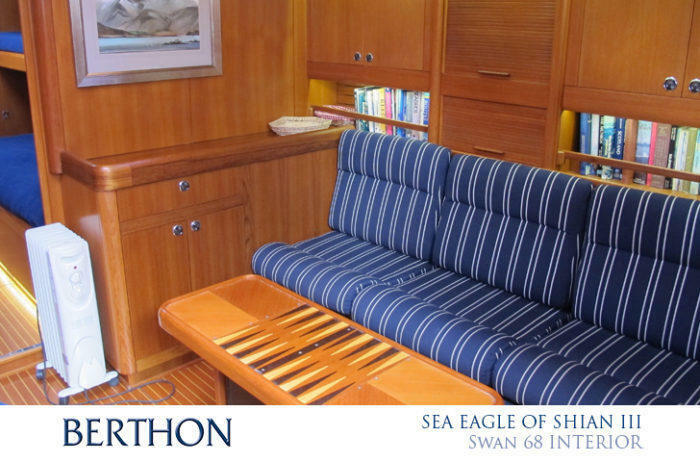 She could also regatta with the best of them should you wish.